The website has been launched by Brian Eugene, who was a member of the earlier mail-based service established by Jens Jurgen. And while Jurgen is not officially involved with this venture, he is pleased to see his idea given new life. He says: Over the years a good number of former Travel Companion Exchange members and travel writer friends kept asking me When are you re-starting this service? So I am very happy that this need will finally be served again by a trustworthy company. And in fact, the most important part of the site the algorithm that suggests potential matches to users based on their travel preferences and habits was based on the original questionnaire developed by Jurgen for his member profile. It had remarkable success in bringing together like-minded travelers so much so that Jurgen used to joke that its success was depriving him of his best members, because so many of them would get married and withdraw their memberships. But Eugene didnt stop there. Users can also employ either of two other sorting algorithms. For quick searches, there is one drawing from just the most basic profile data like language, religion, tobacco and alcohol use, and room-sharing preference. Then for those hoping to find a long-term relationship, there is another based on an in-depth Relationship Compatibility Assessment which probes users personalty characteristics in areas such as aesthetics, intimacy, child-rearing and money matters. In addition, users can customize their search with a wide variety of the usual parameters like travel destinations, dates and budget, and, depending on membership level, numerous other criteria. Eugene got a fundamental insight into the challenge facing single travelers, when he worked for several summers for Elderhostel (now called Road Scholar), leading adult study tours through Scandinavia. He found that pairing up the single travelers, who had to share double rooms, was the most trying part of the job. It would have been so much easier for them if they had had the opportunity to find a compatible person to share the tour with before they embarked on it, he remembers. His website answers that need directly, helping travelers find like-minded companions with similar goals, habits and preferences while their trip is still in the planning stage. While the major competing websites promote an energetic, even chaotic, sort of atmosphere that appeals to a younger crowd, TCE presents a simpler and more tasteful environment adapted to seasoned travelers. Its different approach is immediately evident from the sites graphic design, which has a 1940s retro sort of look that sets it apart. But it is in the areas of privacy and security that the site really stands out. To begin with, there is no free membership, which Eugene says weeds out a lot of undesirables, and goes a long way towards ensuring that only people sincere in their intentions sign up. It raises the level of quality for everyone using the site. Importantly, it allows him to verify the real name and address of every member through their use of a credit card, a key element of security for users. That real name and address, of course, are never shared with other members users are identified on the site with a username they choose for themselves. Once signed up, members have the option of hiding or displaying various parts of their profile, so for instance, a woman who is timid about having her photo displayed publicly can choose to restrict it to only those with whom she has exchanged some text messages first. Some other features of the site, like the photo albums or live chat, can also be configured with differing levels of privacy. Says Eugene: Im serious about our motto, The most reliable travel companion matching service on the Internet. I'm not trying to compete with the mega-sites. Im offering a more trustworthy and personalized service to people who want it. Quality and security thats what were after. Personalized, indeed! Eugene maintains his own profile and blog on the site so members know exactly who is behind the endeavor, and he is often the one to respond to users who submit a query through the Help button. Travel Companion Exchange is an online service for travelers of all ages and interests, who have one thing in common the desire to find a compatible travel partner. 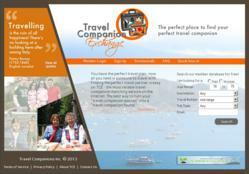 It is operated by Travel Companions Inc., with its office in Rochester, NY.